Plaque commémorative du site expérimental de gemmage en V du Dr. Charles Holmes Herty de l'Université de Géorgie. 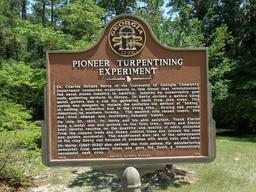 (Georgia – 1776 PIONEER TURPENTINE EXPERIMENT. Dr. Charles Holmes Herty of the University of Georgia Chemistry Department conducted experiments in this forest that revolutionized the naval stores industry in America. Inspired by conservative gum resin gathering methods in Europe, Dr. Herty devised a method using metal gutters and a cup for gathering resin from pine trees. This system was designed to replace the centuries old method of « boxing » or cutting a collection box in the living tree. Boxing had proved disastrous to southern forests. The massive cuts caused insect, fire and wind damage and destroyed valuable timber. On July 20, 1901, Dr. Herty and his able assistant, Frank Kiarpp, hung a metal cup and gutters on the first tree. Herty and Klarpp kept careful records on the quantity and quality of resin collected from the cupped trees and box control trees and proved the cups and guttered successful. The experiment also led to the development of the clay Herty cup because of problems with metal cups used here. Dr. Herty (1867-1938) also devised the first system for manufacturing newsprint from southern pines and gave the South a tremendously successful cash crop. GEORGIA HISTORIC MARKER 1978). 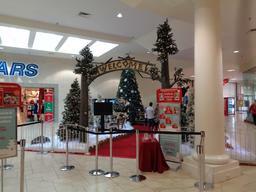 Le village de Santa Claus, Valdosta Mall, Géorgie. 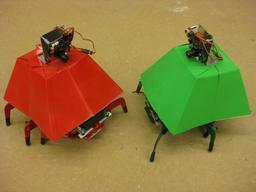 Deux robots hexapodes avec caméra, Georgia Institute of Technology. 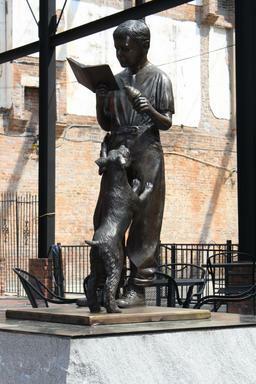 Statue en bronze d'un jeune lecteur debout à Columbus, Géorgie, USA.